If you are suffering from metatarsalgia, you should look into getting a pair of cushioning insoles that would help to correct the problem causing the pressure on the forefoot. Dr Insole’s metatarsalgia orthotics now include a special cushioning pad, helping to absorb pressure from the ball of the foot and forefoot. Poorly fitted footwear can exacerbate metatarsalgia by placing pressure on the forefoot, whereas our insoles are able to remedy the problem by spreading the weight placed on that area more evenly. Our insoles are 100% handmade by our specialists to match your feet and give you the relief and comfort you need. We offer in-shop and home appointments to afford you the greatest convenience, using carefully chosen materials to craft insoles that exactly match your requirements. Metatarsalgia refers to pain that occurs in the ball of the foot – the front area of the foot. It affects the heads of metatarsal bones, which are the long bones located in the midfoot. Metatarsalgia is commonly described as an aching or shooting pain, tingling and burning sensation and sometimes it can cause numbness. Metatarsalgia usually affects the area between the second, third and fourth toes and the ball of the foot. Metatarsalgia often becomes more intense with increased physical activity. Wearing poorly fitting, tight shoes, or high-heeled shoes. High-impact exercise, which places additional stress and pressure on the foot. Wear and tear associated with aging. Medical conditions which include Morton’s neuroma, sesamoiditis, gout, diabetes and arthritis. What is the treatment for metatarsalgia? Resting your feet frequently, in an elevated position if possible, and avoiding high-impact activity that aggravate foot pain. Applying ice to the areas affected by metatarsalgia. Wearing flat-heeled shoes with wide toe box. Wearing foot orthotics – custom-made insoles. 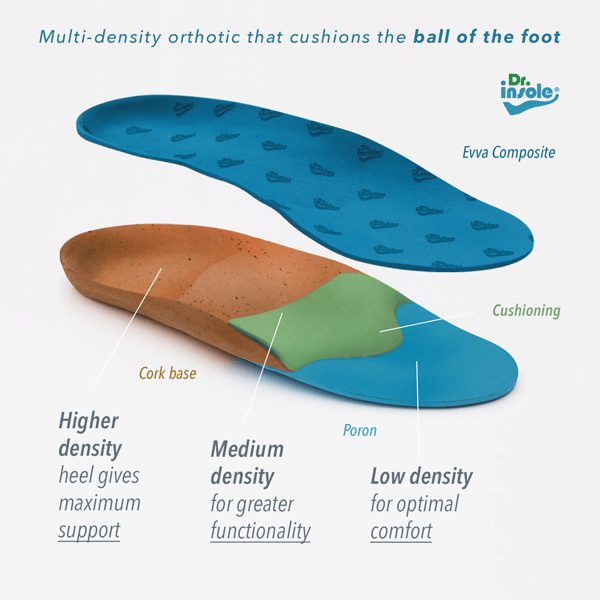 How can Dr Insole’s custom orthotics help? Foot orthotics for metatarsalgia are made-to-measure shoe insoles, designed to enhance biomechanical function of the foot in order to reduce the excessive pressure on the metatarsals and the ball of the foot. Custom-made orthotics also protect and cushion the areas affected by metatarsalgia. 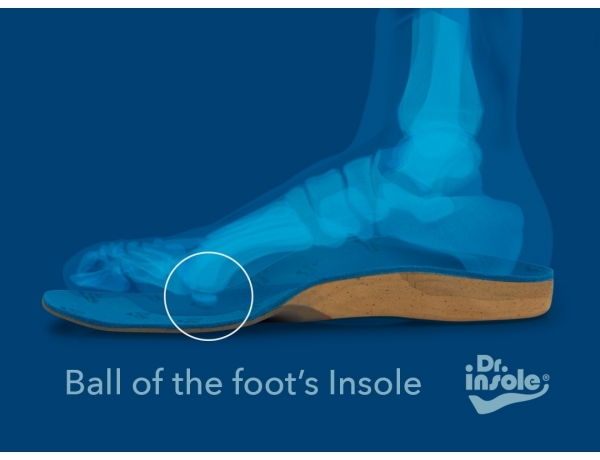 Dr Insole’s bespoke orthotics for ball of the pain are customised to your feet – the vulnerable areas on your feet are appropriately aligned, supported and protected, which allows our insoles to effectively absorb shock exerted on ankles, knees and hips during walking and practising sports. Our orthotics for ball of the foot pain provide appropriate alignment of metatarsal heads and help unload the pressure that is placed on the ball of the foot, which helps reduce pain and discomfort in the forefoot. 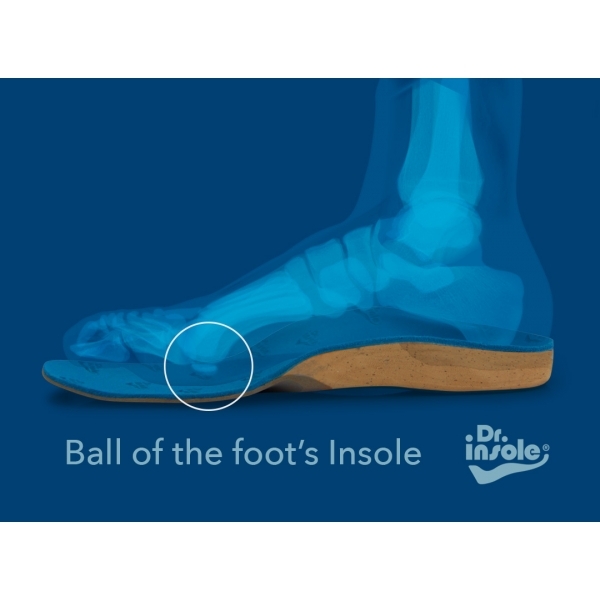 Dr Insole’s custom orthotics for the ball of the foot conditions effectively alleviate pain and discomfort in the forefoot. Our insoles help position your feet in the neutral alignment, unloading the excessive pressure that is placed on the ball of the foot. Appointments are free of charge.